Join us for a lunchtime vigil on Palestinian Prisoners’ Day, this Wednesday 17th April between 1pm and 1.45pm outside the AXA’s Dublin offices on Wolfe Tone Street, Dublin 1 (map here). With over 5,400 Palestinian political prisoners – more than 200 of them children – behind bars in apartheid Israel’s prison system , 400 prisoners have launched a hunger strike aimed at improving the awful prison conditions they live under. 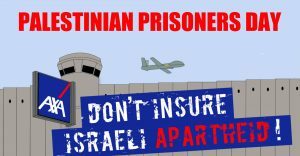 All Palestinian political prisoners are entitled to fair trial guarantees under international humanitarian law and international human rights laws, someting which the Israeli occupation prison system does not provide. Palestinian political prisoners and detainees are systematically subjected to torture and ill-treatment with continued impunity. The issue of Palestinian prisoners and detainees held in Israeli prisons and detention centers transcends one of the individual human rights; it is also one of the collective rights of an entire people – the Palestinian people, who continue to be deprived of the right to self-determination and sovereignty – basic fundamentals of international law. AXA is a multinational company that profits from these violations of rights and international law. AXA invests in the top five Israeli banks and in Elbit Systems. Several recent reports by international human rights organisations reports confirm that all Israeli banks are involved in Israel’s settlement industry by providing special loans for companies, governmental or individual projects in occupied Palestine. The five Israeli banks that AXA holds shares in (Bank Hapoalim, Bank Leumi, Bank Mizrahi-Tefahot, First International bank of Israel and Israel Discount Bank), contribute directly to the maintenance and development of the illegal settlements. AXA is thus sustaining Israel’s illegal annexation of occupied Palestinian territory and violation of Palestinians’ right to self-determination. Elbit Systems, Israel’s biggest private military company, sells newly developed weapons to the Israeli army to be tested on Palestinians, so the weapons can then be sold internationally as “battle-tested”. Elbit Systems also produced the banned chemical weapon white phosphorus which Human Rights Watch revealed was used in Israel’s attacks on Palestinian civilians in 2009. Elbit Systems also provides material assistance for Israel’s apartheid wall. AXA claims commitment to its ethical guidelines, but by maintaining these investments AXA is complicit in the oppression of Palestinians. AXA provides life insurance worldwide, protecting and supporting people in difficult life situations, while assisting Israeli apartheid. Palestinians deserve the same rights as anyone else. AXA can’t sustain this paradox: insuring while at the same time contributing to oppression of Palestinians. AXA MUST DIVEST FROM ISRAELI BANKS FINANCING THE ILLEGAL SETTLEMENTS AND FROM ELBIT SYSTEMS.